Home » Blog » Scholarship Winner: Giving back to the mom that gives so much! Scholarship Winner: Giving back to the mom that gives so much! Meet Samantha: A wonderful mom to her 3 babies and the many children she fosters. I am so excited to say that I have been awarded a doula scholarship!! It is such a surreal thing for me. My name is Samantha. I identify myself as a wife, mother, and student. My husband is a Loss Prevention manager at a local retail store (he catches shoplifters) and a full time criminal justice student. We met in high school, I was 15 and he was 17. We’ve been together ever since. We will be celebrating our 6th marriage anniversary this August! We have 3 beautiful children of our own, they are 6, 4, and 9 months! I am so lucky to be able to stay at home with them. I’ve been a stay at home mom since my 6 year old was born. In addition to our three kids, we are also foster parents. We’ve had 15 kids come and go from our home since we started fostering! These kids leave such a huge mark on our hearts. We really are so blessed to be able to love these children and help the through their hard times. It hurts when they go, but it is so worth it to be a part of their lives even if it’s just for a little while. While being a stay at home mom I have also been taking college classes online. I am in the midst of earning my Administrative Assistant Degree. I am nearing the end of my college time and often wonder what I will do once I have completed this degree. I can’t even count the number of times I have said “I wish I could utilize my degree without having to be gone from all my kids for 40+ hours a week.” That led me to my search for something I could do, something I am passionate about, without having to spend most of my time in an office. I love being pregnant, I love pregnancy, I love helping people, I love learning… Hello- I need to be a doula!! I found Bebo Mia quite a while ago, but with college and kids I just couldn’t afford it. My husband and I have tried figuring out a plan to save for the certification costs, but something always comes up. You know how it is, every time you think you’re ahead another necessity comes up. I don’t even know how many times I have looked at the website, trying to figure out how I could make this happen… then I saw the scholarship was open and thought “I’ll never win, but what does it hurt to try? !” And here I am… I won a scholarship! Because of financial reasons, I had my first 2 kids with no doula or support person (other than my husband). 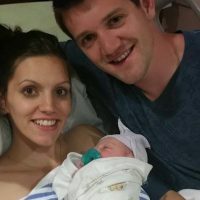 I was induced for non-medical reasons for both deliveries and ended up having an epidural with both. I liked my birth experiences because I had two perfect babies, but it wasn’t what I had envisioned. I didn’t feel empowered how I always imagined a woman should after she has a baby… instead I felt defeated. With my third baby I had my sister there to act as doula. She has no training or anything- but having someone there made a world of difference. I was able to deliver naturally and be fully aware and have the birth I had always dreamed of. I would live that day 100 times over if I could. Having that extra support helped me so much. I also read a few doula books during my pregnancy and I think that helped me to understand my own body and the delivery as well. After having such a great birthing experience I knew without a doubt in my mind that I wanted to do that for other women. I am so excited that I won this scholarship, that I am going to learn how to be the support someone needs to feel how I felt when I had my third child. I am so excited for this journey!! I will be finishing my Administrative degree this summer and then the doula training shortly after! When all is said and done I want to have a great understanding of everything maternity/postpartum and everything business. I want to be able to help women have the births they have dreamed of. I want to be flexible and help women like me, women who deserve to have a birth support person but just can’t afford to. This is going to be a life changing journey for me and my family. I am so excited to have been chosen for this scholarship and I can’t wait to get the ball rolling!! !